The search for the head coach of the inaugural 2019 San Diego Strike Force resumes. Ameer Ismail was announced as the team's first head coach in franchise history on December 17. 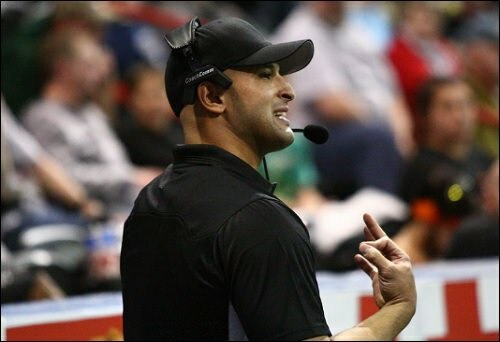 It has been announced by the Carolina Cobras of the National Arena League (NAL) that Ismail will be joining their coaching staff for the 2019 season. It has not been confirmed which position he will fill but. He will serve under head coach Billy Back. Ismail, who won NAL Coach of the Year Honors last season with the Massachusetts Pirates, made this statement on the Cobras' official website: "I’m just wanting to come in and help in any way I can under coach Back's guidance Whatever the team and organization needs from me, I will do." We at SCtoC were the first to report of Ismail's hiring with the Strike Force on December 4, though the official announcement came nearly two weeks later. A confidential source to this site has told us that the team is looking at potential head coaches in or around the San Diego area. SAN DIEGO, CA: The San Diego Strike Force have their first-ever head coach. The official announcement was made by the team at a press conference on December 17 that Ameer Ismail has been hired to coach the team. The Strike Force also revealed their team colors and Jerseys. We at SCtoC, through a confidential force, reported on December 4 that the Strike Force we're planning to hire the former National Football League linebacker and now-former Massachusetts Pirates (National Arena League) head coach head man as they embark on their first season in 2019. The Strike force were announced on November 19 as the Indoor Football League's 10th franchise for the upcoming season. They join the returning Arizona Rattlers, Green Bay Blizzard, Iowa Barnstormers, Nebraska Danger and re-branded Cedar Rapids River Kings. Also new to the league are the fellow expansion Tucson Sugar Skulls, and Bismarck Bucks and Quad City Steamwheelers; the latter of whom came over from Champions Indoor Football earlier this off season. Ismail is no stranger to the various levels of professional football. He led the Pirates to an 11-5 record in 2018, earning a trip to the NAL semifinals. The went on to lose that game to the Columbus Lions by a score of 50-36. The previous season, he was the head man for the CIF's Bloomington Edge, leading them to a 7-5 record and a playoff berth. He served as player and coach in 2016 in Arena Football League China. He began his coaching career in 2014 as Mark Stoute's defensive coordinator with the Cedar Rapids Titans of the IFL (now the River Kings), and in the same capacity the following season with the Spokane Empire. The former linebacker was with the NFL's Kansas City Chiefs and Jacksonville Jaguars before moving on to the Jacksonville Sharks and Milwaukee Mustangs of the AFL. He made his mark as a player in the IFL with the Tri-Cities Fever, Edge and Chicago Slaughter for a season each in 2010, 2012 and 2013, respectively. His best season was with the Edge. He was named IFL Defensive Player of the Year during that season, tallying 167 tackles in just 12 games. He finished his IFL career with 257 tackles, 14 sacks, five interceptions, eight blocked kicks and five forced fumbles. Ismail also is an IFL Hall of Fame finalist. Ismail earned bachelor's degrees in exercise science and physiology, and a master's degree in sports management and administration. He attended Wstern Michigan University and Ball St. University. He is originally from East Lansing, Michigan. San Diego opens season on February 22 when they visit the Steamwheelers. Their home opener is on March 3 against fellow expansion Tucson. Click for the team's full schedule. The Strike Force is owned by California businessman Roy Choi. The IFL is entering its 11th season. The Iowa Barnstormers will attempt to repeat as United Bowl champions.